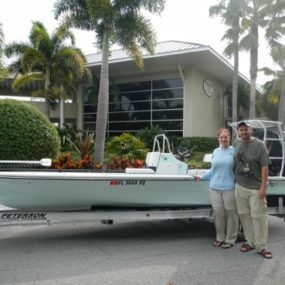 It was love at first sight, when I first laid eyes on a Beavertail Vengeance Skiff. It was long and sleek, yet looked light and nimble. I never forgot that day or the image. Several years later, the time had finally come too regrettably start thinking about replacing my back country skiff. She had serviced me faithfully for many a year and I wasn’t sure I would find an equal replacement. 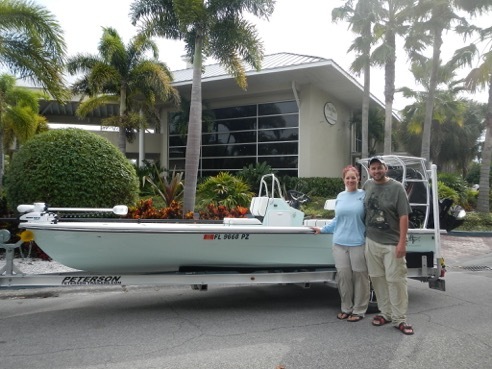 A boat that could fish the shallow waters of the Ten Thousand Islands, chase bone fish and permit on the ocean side flats and still make the run to the Marquesas’ for tarpon on fly. I started my search at the Miami Boat show. I looked at a number of skiffs and supposed shallow water craft and wasn’t overly enthused on looks, quality, and in some cases, price! Towards the end of the day and somewhat disappointed, I turned down the last isle and there she was, a Beavertail Skiff. It was a fully equipped 17’ Strike, what a machine. As I looked her over and felt her clean lines, I realized that my search had come to an end. 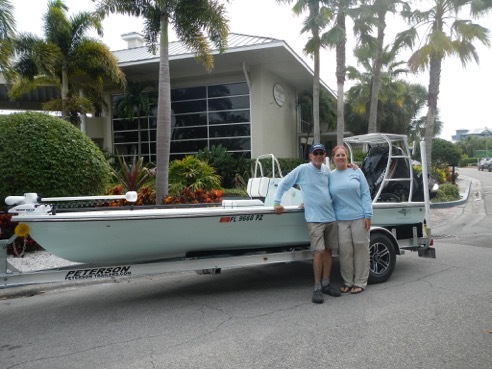 That is when I met Will, the owner of Aeon Marine and Beavertail Skiffs. He spent quite a while with me, answering all my questions and explaining the technical aspects of the construction and performance features. I would have purchased this boat on the spot but Will suggested that since I liked to fish three people most of the time, perhaps the 18’ Vengeance would suit me better. Will invited me to visit the factory shop and water test any of the models available. He put me in touch with Liz, his better half, to make arrangements for the factory visit and start the process of designing and pricing up my dream boat. Let me tell you, Liz is a super wonderful person, very friendly and knows her business. She made the process seamless answering any questions, and was especially helpful in selecting the options and most of all the color combinations. Liz is very detailed and returned all inquiries promptly. Finally the day came for the visit to the factory shop. I brought my daughter Marandi and her boyfriend Ryan along as they were a big part of my decision to purchase a new boat. I was relying on them to help make the final choices in outfitting the boat. As we walked in, we were greeted by Liz and Will and I felt like we were meeting old friends. Will took us for a tour of the operation and we were able to see the various model boats in different stages of construction. One could see the high quality of craftsmanship and materials being used. The building was very clean and organized. It’s no wonder they turn out such a high quality product. After visiting the factory we went to the sales office to finalize the order. It could not have been simpler. Liz had all the paper work in order and a list of all options. We decided on colors, added a few more options and the deal was done. I might add, Liz was able to put me in touch with a bank specialist and insurance agent, of which both were able to provide friendly services below the going rate. 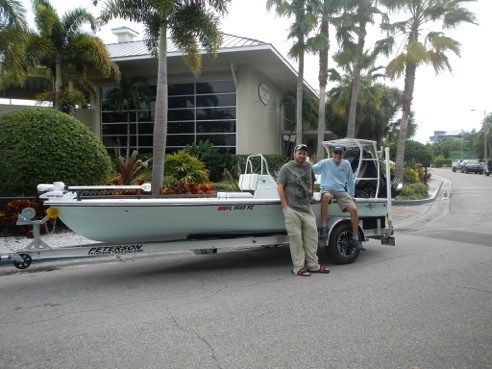 If you’re in the market for the highest quality shallow water skiff, at a most reasonable price, then look no further. 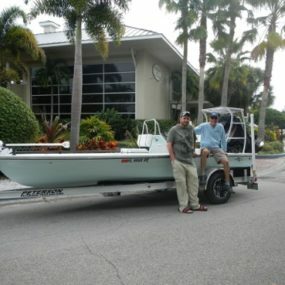 I highly recommend Aeon Marine, Beavertail Skiffs. From the initial design stage thru the manufacturing process and final commissioning, it was a pleasant and enjoyable experience. 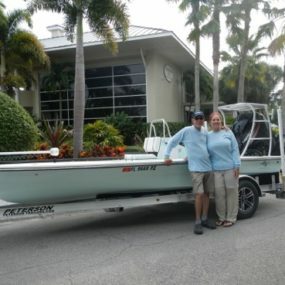 At Beavertail Skiffs, they not only build boats, “THEY BUILD DREAMS”. Now go out and get your dream and join the Beavertail family!